How to beat this week's Brawl and unlock a higher Firework level. Our Ragnaros' Fire Festival Brawl guide explains Mini-Rag's mechanics, the card pack and firework rewards, and the best deck for beating the challenge. As we build up the launch of The Boomsday Project, Blizzard has reintroduced last year's summer Brawl called Ragnaros' Fire Festival. It's all part of the Midsummer Fire Festival celebrations, which you may have noticed has doubled the rewards you receive for completing Daily Quests. In this article we've got a complete overview of the Brawl, tips for completing it, and some suggestions around the decks you might like to consider building if you want to come out on top this week. We've also got confirmation of the rewards involved for taking part in the Brawl. 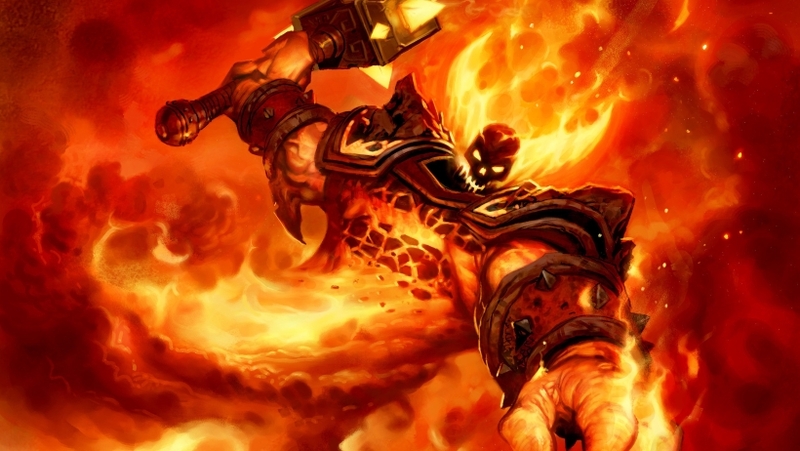 Without further ado, then, here's everything you need to know about Ragnaros' Fire Festival! Before taking part in the Brawl, you'll need to craft a suitable deck (see a little further down the page for help on this). When each match begins, an immune 2 / 3 Mini-Rag will spawn on Player 2's side. Hit End Turn and Mini-Rag will fire one damage missile for each point of Attack damage he possesses at your side of the board. Any minions he kills will increase his Attack value by one point. Mini-Rag then changes to the other side of the board and the other player takes their turn. This process then repeats throughout the match. Whenever Mini-Rag kills minions your personal score tracker will increase. If you can increase this score to 8, you'll unlock Level 1 Fireworks for your Wow emote. Kill 30 minions and you'll get Level 2 Fireworks. Kill 60 minions and you'll max out at Level 3 Fireworks. You do, of course, also receive your Classic card pack for winning your first Brawl this week. The objective here is pretty simple. The wider the board you have the most opportunities Ragnaros has to grow. Minions that die also take a little of the sting out of the punishment your hero will take throughout the course of the match. Not only that, but by trashing lots of minions you'll unlock those Firework upgrades faster too. By far the most success we've had with this Brawl has come from using the deck created by YouTuber kiwiinbacon. Here's a video of it being played, followed by the deck list itself. It requires a few cards from across Hearthstone's history, so if you've had luck with a more budget-orientated deck list then we'd love you to share it in the comments.